Owing to our experts and rich industrial knowledge, we are keenly successful in presenting Copper Cable Scrap. We offer these in various packings. We offer them at market leading rates. Best in working, these Copper Cable Scrap are offered in the market in many sizes. Easier to use, these copper scraps are best in quality and superior in performance which remains sustained for many years. Our presented durable scraps are made very precisely by using best material that is safe from heat and pressure. We provide our customers an excellent quality range of Copper Cable Scraps. These copper scraps are recycled to fabricate unadulterated copper goods, tools and are extensively used for engineering and the railway field. Our clients can avail these products from us at most competitive rates. 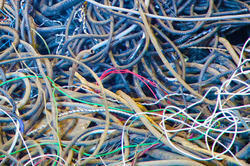 Our Copper cable wires scrap have essential physical and chemical attributes. These Copper cable wires scrap are widely used in different industrial applications. Our scraps are widely used to manufacture various other products. It requires less energy when a product is to be manufactured from recycled scrap than from virgin metals. Backed by years of industry experience, we are engaged in offering a premium quality range of Copper Cable Scrap. We have copper armature scrap at owr own yard Greater Noida, Noida, Uttar Pradesh, India. The same is extracted from electric motor scrap. M/s.Sakthi industries is an accredited company for dealing comprehensive of all ferrous and non-ferrous scrap merchant in all over the India. We are the leading organization in the industry to provide our clients the best quality array of Copper Cable Wire Scrap.